EDITOR’S NOTE: A number of people have asked us about where to find replacement line. 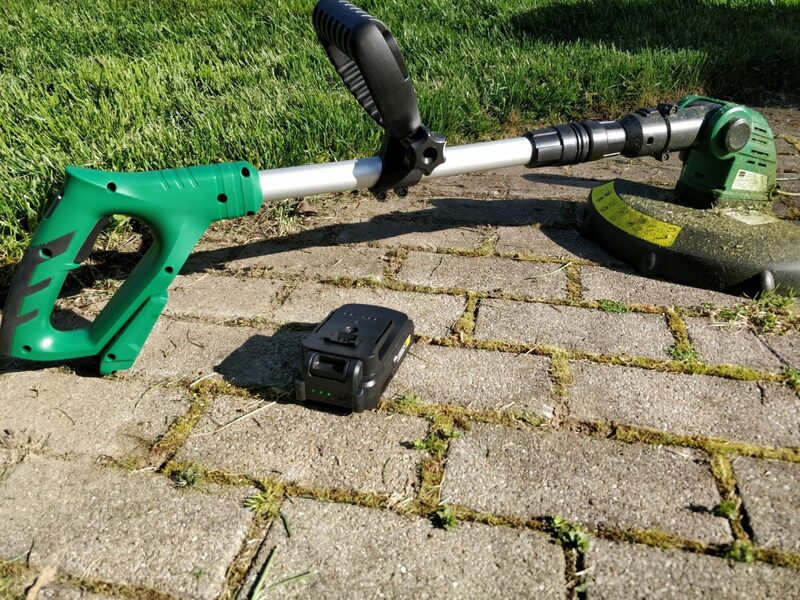 The Gardenline trimmer uses a 0.055 inch (1.4 mm) line, which is not a common size in the United States (although it does seem more common overseas). Most hardware stores don’t carry line in this size, which can be frustrating for consumers. When we reached out to the trimmer manufacturer, Sumec North America, they referred us to the replacement trimmer line available on its website. Note, though, the shipping costs are very high unless you buy in bulk. You may also be able to find the trimmer line other places online. This is a guest post by Lee. You can read our roundup of other Aldi lawn equipment here. Unboxing the trimmer was rather uneventful. It is a lot lighter than anticipated (~10-15 lbs. ; no official weight found). It comes assembled with the exception of the shield and battery. The shield clips on without effort. The battery and charger were in their own boxes, but they are equally easy to get working together. I plugged the battery in to charge and unplugged it the next morning. The trimmer seemed short, but no worries; it’s on a telescoping pole, so you can adjust the height. It feels like something is in the pole to assist the retraction, but it does not stop the ease of extending the height of the trimmer. The mechanic also doesn’t make noise inside the aluminum pole. 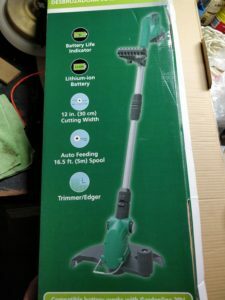 The handle has a wingnut and bolt that allow the user to change the angle when holding the trimmer, while the green handle at the top holds the battery pack. The other end has a push button to change the angle of the trimmer head, as well as a switch that allows the trimmer head to rotate. Using the trimmer was equally easy and uneventful. Popping the battery into the handle, I walked up the driveway, pressed the thumb switch, and pulled the trigger, and it started to spin. I did not feel the torque I was used to from the gas-powered string trimmer, so I was a little concerned. 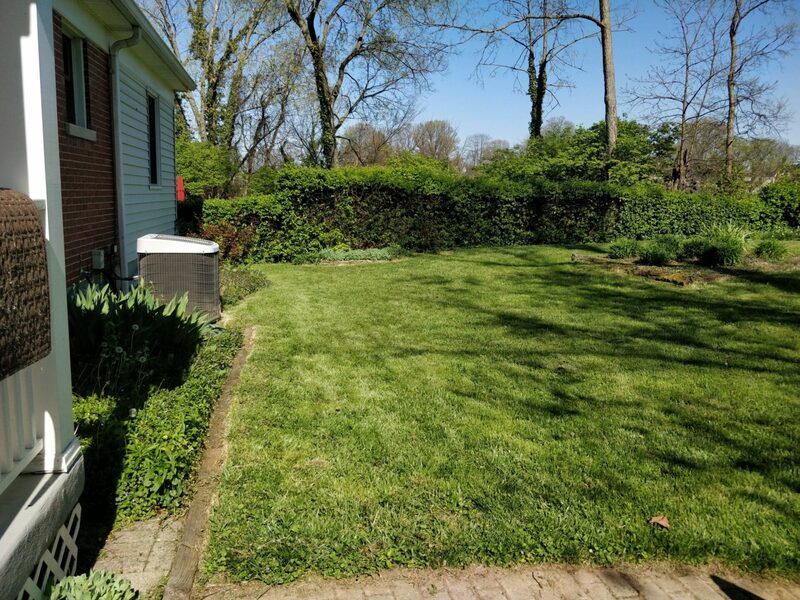 But when I held it to the height I wanted, it easily cut the blades of grass to the height I wanted. (An unexpected surprise to me was how being able to change the neck and head of the trimmer made the work much easier.) 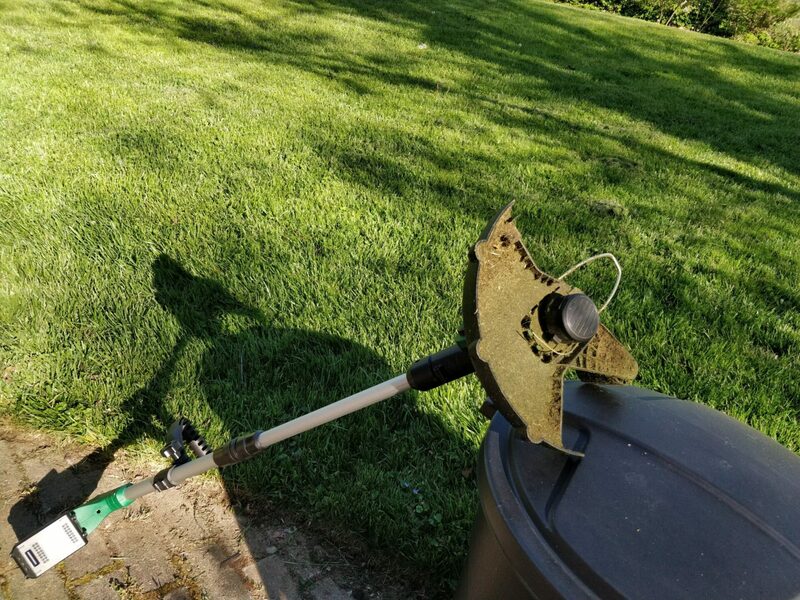 I got to the end of the line, stopped, took my finger off the trigger, rotated the head, and used the wheel to walk the trimmer to edge along the sidewalk. It was quick, easy, and painless. I moved along the rest of the yard. Due to how long it had been since I last trimmed, I had to give more attention to some areas than others. The trimmer seemed to stop working after about 30-40 minutes of continuous work, getting me to the front of the house. I’m not going to pretend it has the power to cut brush, but it did cut through some hardy ivy that was moving off my stone wall onto the driveway. After the battery was empty, I set it to charge, and I mowed the lawn. After mowing the lawn (about 1 to 1.5 hours) I checked the battery and it had not fully charged. I grabbed the battery pack the next day and did the back yard. I believe I made the trimmer do heavy work due to the lack of trimming done over the past year. I think next week’s touch ups will be completed on one charge. I like the result in the yard. On the positive side, this trimmer is quick, easy, and intuitive to use, with a lightweight build and no fuss. On the negative side, the battery takes a long time to recharge and there is no secondary battery (unless you have a battery from another Gardenline product). Overall, at this point in time, I would buy this product again. I would also refer this product to a friend, or gift this product to my elderly parents. Lee is an Instructional Designer for a university and lives in the Southeast region of the US. Aldi has been a part of his life since he was an undergrad 18 years ago. Being impressed with the quality of food, he is slowly expanding his interest into home and lawn goods. Hi. I bought the trimmer and I am impressed with the product for the price. But I am running out of line and I can’t find where to buy replacement line, 0.055″ or 1.4 mm. Or even a spool if I have to. Do you have any suggestions? Thanks. We’ve updated our post with what we know. I’m having the same problem. Can’t get an extra battery or string. The one site that advertised the string cartridges seems to be involved in scams. I bought my first unit from the previous owner of my home, then bought a second thinking I could get string and that I would have a second battery. Turns out that even though the Aldi part number is the same (52646), the batteries are not compatible and both are the 20v models. I would not recommend buying this – you can’t get supplies or parts in this country. I don’t understand why an international firm would sell a product it can’t support. I am returning my Gardenline trimmer from Aldi. Very, very disappointing. Bought it two weeks ago. I cannot find any .055 string replacement (I went to Home Depot, Sears, and Ace Hardware). DON’T BUY THE ALDI Gardenline Trimmer! I have been waiting on Aldi to get the Gardenline Cordless Trimmer in for sale. I bought one a few years back and loved it, and it has been well used. I am on disability and it is lightweight and I can use it well. Please let me know when you will have any in the stores in Weaverville or Asheville, NC. I love my Aldi stores. It runs around $39.99. Thank you for your feedback. Hi Shirley, we’re not Aldi, we’re an independent site that reviews Aldi products. The Gardenline Cordless Trimmer just came back in the stores a few weeks ago. It’s possible one of your local Aldi stores might have one still but it’s been a little while and it’s possible they may be gone by now. If that’s the case, you won’t be able to find any until next year. Any idea where to get the string for this trimmer? I’ve updated the post (see the top) with what I know. I’ll update it further as I learn more. The link to the website above to purchase the replacement trimmer line is broken. The replacement parts for the trimmer are being handled by forcetoolsusa.com. As of this writing, the replacement batteries are on back order and can be purchased at that site when the arrive. On my trimmer, the China man who wound my line spool, wound it too tight and kinked the line, so I have lots of experience with the line spool. 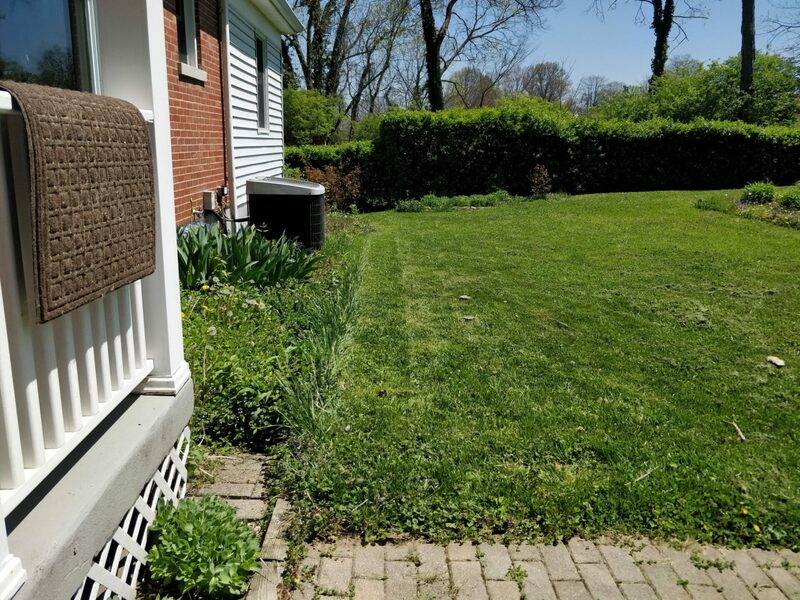 I finally removed all the original trimmer line and replaced it with .065″ diameter line I bought at that huge blue home improvement store that begins with the letter “L”. I paid $10 for 200 foot of line and the difference in size is only about .20 mm. The machine will never know the difference and it worked perfect for me. Do yourself a favor and buy the cheap .065″ line and rewind it yourself. It’s so easy. There’s even an arrow to help with the direction. Then wait for the batteries to pop up on the web site and get one of those too, if you need it for bigger jobs. This site sells this replacement line for $5.99, but the only shopping option is $7.10 priority mail. Bought it at Aldi’s at the beginning of summer. For the price, it’s excellent. I’ve had inexpensive black and decker trimmers in the past and this one works as good or better. Just now running out of line and found this site. Susan’s link above is good source. I like David’s suggestion for .65mm line. I will try that. Great review Joshua! This company sells Garden Line supplies. The replacement string spool is out of stock. I have seen some others on Ebay but not sure if they fit this specific model. I really like this trimmer, it is the second one we bought since my husband misplaced the battery charge for the first one we bought in 2017. It is lightweight and easy for me to handle. My husband has muscular dystrophy with weakness in his hands and this one is easy for him to use as well. I ordered a second battery from the Sumec (Force Power Equipment) website. When I opened the box, I found a broken battery inside (the outercase was open and I could not close it again because the holes for the screws had broken off). I contacted Sumec first by mail > no answer. Then I called them, they found back my mail and promised to follow up > no reply. I called them again and finally they sent me a new battery. This time it was not broken when it arrived … but it showed the same problem after 4 or 5 uses. 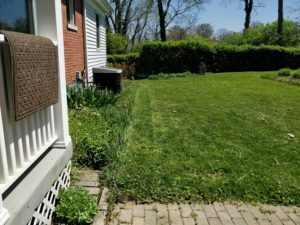 I contacted Sumec again … 3 times > no answer. Final result: I have one working battery (the original one) and 2 broken ones. 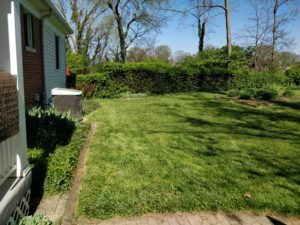 I can not trim my yard in one go. I can do 2/3 with one battery. Then I need to take a +2hr break to recharge the battery before I can do the rest. I will never buy a Gardenline product again and I will never buy an unknown brand at Aldi again because of their lack of spare parts and service. We once had a difficult experience with an Aldi vendor and we ended up contacting Aldi directly after the vendor was unresponsive. (www.aldi.us/contact/) We found them helpful in getting the situation resolved. Last year I bought all three of Aldi’s Gardenline cordless yard tools: The edger/trimmer, the hedge trimmer and the blower. I wanted to wait to review them until I had a chance to use them for all of last year. I am happy to report that I am very satisfied with all three. These are light duty items, so as long as you keep that in mind and your needs are not severe, they are an excellent value. I think for most average sized suburban yards, they would be plenty adequate. As the review above noted, each item comes with one battery. This is cheap, but the battery life is actually good. I can do all the bushes in my yard (a lot, 30+) with the hedge trimmer on one battery. I can do the sidewalks and driveway with the edger on one battery as well. The blower uses batteries the fastest and sometimes requires two batteries if I am blowing a lot. By buying all three products, I have three batteries which eliminates any potential battery anxiety. On the rare cases when I would use all three products on the same day, it would be a long enough project that I could plug depleted batteries in as I use them and they charge pretty quickly. I like the charge indicator on the batteries, too. The edger does use very thin trim line, with only one line sticking out rather than two like heavier duty edgers have. This worried me initially, but it works well enough for my needs. I live in Houston, where we have thick St. Augustine grass and it will cut through it fine. Maybe not instant vaporization like you would get with a powerful gas unit, but good enough. I replaced the .055 line with .065 which is easier to find. It doesn’t advance quite as easily, but it fits and has the advantage of being a bit tougher to break. I like the rotating handle and adjustable head. I can use it vertically like an edger for sidewalks, then switch it to horizontal for other trimming. The small wheel is a nice feature for edging. The hedge trimmer works great. It is a bit smaller than some I’ve seen but I have no complaints at all about its function. As I mentioned above, you’d have to do an awful lot of trimming to run through a whole battery charge. The blower is the most conspicuously light duty of the three. Don’t expect a wind storm to come out of it like you would get with a larger plug in or gas unit. For my purposes, though, it is fine for collecting grass clippings on the driveway or patio. I kept my plug in blower for collecting leaves in the fall. The Aldi one is too small for that. The switch might be a weak point with these. My switch failed pretty soon. Fortunately, the stores still had them in stock and I was able to exchange it for a new one no problem. It went the rest of the season without any issues.